Emerging from the gates of Welikada jail where he had gone to see firsthand the penance his permanent secretary was paying for acting on his orders, former president Mahinda Rajapaksa flared in anger when answering questions raised by the posse of journalists as to whether he held himself responsible and felt any remorse for the fate that had befallen his trusted lieutenant Lalith Weeratunga for following his illegal orders without question. For once, Lanka’s top doctor of spin found to his dismay the ball did not turn to his liking on a pitch that had long gone dry. For once, the maestro of voice cuts, a propaganda device he had used splendidly to stroke his political message beyond the boundary line, found to his horror his throat suffering drought too; and incapable of delivering the biting invective against the Government, hurled repeatedly in the aftermath of his defeat, which had served so well to keep him in the public eye. For once in his life, he found the mask of charisma – carefully built, propagated, aggrandised and successfully implanted in many a Lankan mind – slip without warning when the rat pack of media men sprayed their verbal fire upon a man whom many would have readily kissed the ground he walked on just a couple of years ago. His reply: “This is no wrong doing. People are trying to portray this as a wrong doing but it is not a wrong. It was a request made by the people to me. There were ten or eight other requests. For all these eight requests, on that day itself we reserved the finances. b)But is it against the election law that gifts cannot be distributed during an election as the Election Commission has repeatedly stressed? His reply: “No this is something we had already sent. So accordingly those officials distributed it in the provinces. We had already sent it earlier. c) Along with your photograph and ……? His reply: “No, no. That is false talk. d)Do you take responsibility for this? His reply: “It’s my order. But the judge said that I have not used force. I do not know what was meant by that but when I tell a secretary to do something it becomes an order. Not that I have to take a pole and hit the secretary and order that he must do this or that. e) But hasn’t the Election Commissioner said that such gifts could not be distributed once an election had been proclaimed? His reply: “Then you have to ask the Election Commissioner. This is not an election case. f) Then are you saying that the fault is with the people who distributed these gifts? His reply: “No. There is no wrong in this. I told you, no, I accept that I am the one who issued the order. g) Yes, you may not be at fault but then these gifts were distributed. His reply: “Here, you don’t come to rile me. You want to make this a big media circus. That’s enough. When a man says he will accept responsibility for his acts if he had committed any wrong but then nonchalantly usurps the role of an independent judge and proceeds to pass judgment on his own conduct and declares that no wrong ever has been done by him and holds himself innocent of the charges laid at his door by his own reckoning, it is clear he has taken leave of harsh reality and that his senses have fled to the redeeming realms, to the cuckoo land of fantasy. It’s not a time for vile condemnation. It’s a time to pour pounds of pity, to show compassion in the manner the Buddha has advised all to do – be it to friend or foe – for mortal men act thus out of ignorance. It’s a time for understanding, a time to extend the nation’s heartfelt sympathies. A time to grieve and bleed with the immense burden of remorse Mahinda Rajapaksa must feel to know in his heart of hearts that somehow, whether his actions were right or wrong, he, as the first citizen of Lanka, was the sole cause of the then first citizen of the Civil Service lying incarcerated in jail whilst he, Mahinda, has the freedom to roam the broad acres of the land and declare to the media that he only made a verbal request to Weeratunga which was obediently followed without question. How true. No one could have nailed Weeratunge’s voluntary collusion in the sil cloth scandal to the cross of guilt better. 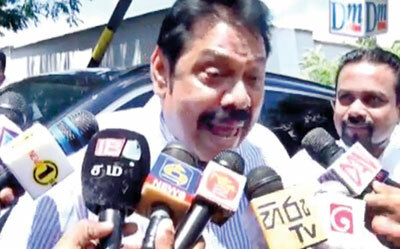 True to his word, Rajapaksa issued a statement this Thursday on the issue. Not so much in the manner of a defence counsel arguing in the interest of his client but more so in the manner an appeal court judge, nay, the chief justice would deliver his considered judgment. After hearing his own case. And pronounces his order was ‘legitimate’. In this statement he says, amongst others, that “The verbal instructions given by me in this regard have been recorded in the form of minutes placed by Mr. Weeratunga on correspondence with officials of the Presidential Secretariat. The judgment itself states that neither Lalith Weeratunga nor Anusha Pelpita had appropriated for their personal use any of the money used to purchase sil redi. From my point of view, they only carried out legitimate instructions issued to them by the President of the country. Does that make the presidential order legit? Perhaps the former president has missed the point completely. FIRSTLY, the question is whether he, Mahinda Rajapaksa, as president of the country, had the legal authority to verbally instruct his permanent secretary, with or without the use of a pole to bash the poor man to do his bidding, to follow an order which, Weeratunga – who had risen through the civil servants ranks and was no new born babe sipping mother’s milk, not wormed and weaned – would have known had no legal basis? SECONDLY, he states, “The severe sentence imposed on Lalith Weeratunga and Anusha Pelpita is not because they enriched themselves through corrupt means”. Again Rajapaksa seems to have missed the bus. The issue is not whether Weeratunga or Pelpita personally enriched themselves from the sil cloth saga. The issue is whether the then President Rajapaksa had the legal authority to issue verbally or otherwise to his secretary to transfer funds from one government entity to another without first obtaining cabinet approval and treasury sanction and following standard procedure when it came to public finance. That is the crux of the matter. THIRDLY, the Rajapaksa De Profoundis statement claims that giving sil redi to the nation’s upasikavan was due to a request made by the public. Apart from the fact that many in Lanka would readily become upasikavan overnight when it comes to receiving anything free, what right does a president have to grab public money in public institutions, to dip his hands in the public till, and spend it as he pleases, as it were his own – as if he was giving instructions on the cell phone to his bank manager and requesting him to transfer Rs 600 million from his personal account to another account in another bank? And, thereafter, attempt to justify his act by reference to some vague and unfounded request supposedly made by some sil observing public that moved his mood to do charity and amass merit at public expense? Is this the way the public money was handled by the Rajapaksa regime entrusted with its care, imposed as it were with the beholden duty to act with care as trusted guardians of the nation’s money, not as spendthrifts of the public’s cash? Rajapaksa’s defence is that it’s all right, no problem, what’s the fuss — or as it is succinctly expressed in the vernacular “avulak nahay” — because it was to be reimbursed at some future date; and anyway it was all done for a good cause. According to him “ Sections 218, 115, 65, 66, 68, 93 and 94 of the Financial Regulations of the Government of Sri Lanka also authorize ‘Chief Accounting Officers’ (who in the case of the Presidential Secretariat was Lalith Weeratunga) to transfer money between government agencies under his authority on the basis of reimbursement — a cheque with the date left blank. In his own supreme court over which he was judge and jury probably that would have been the inevitable conclusion. But whether it will hold water before an impartial tribunal, bereft of his legal wisdom, is left to be seen. Amazing, is it not, that he had thought it fit to interpret the election laws of the land. And this in spite of denying before the media corp, four days before at the gates of the Welikada jail, that it was a total falsehood to say that his photograph had appeared on each and every sil cloth distributed to the devout. And now here in his statement he readily admits his name was plastered on the pristine cloth with the descriptive tag as being a religious gift from Mahinda Rajapaksa – mind you not from the President, but up close and personal, in pursuance of his own ‘ chinthana’ philosophy. Not a word that you and I – the masses of this country – had any hand in this charity. In fact we could not even place our hands upon it and say sadhu, sadhu, let alone a mention in the label. But as Rajapaksa’s statement says, “This was only a label stating the provenance of the sil redi. If public money had been used to do this charity, and if the label declared its provenance, shouldn’t it have been mentioned that the real origin of the gift had stemmed from the people of Lanka and not solely by Mahinda Rajapaksa? FIFTHLY – and this takes the cake – Rajapaksa’s statement declares that sil cloth was distributed in pursuance of the government’s constitutional duty to promote and foster the Buddha Sasana in accordance with Article 9 of the Constitution. But does the Government, according to its constitution brief, have any such duty? The constitution is nearly forty years old now but not a single president has ever been struck that the constitution demands that clothing should be provided to assist the pilgrims’ progress to enlightenment. to assist the propagation of Buddhism and Buddhist philosophy and maintain the nature of the Buddhist state via necessary legislation. Was this the manner in which the then custodians of public finance, in whom the nation had reposed its trust and faith, played ducks and drakes with the people’s money? But the fact remains that he, as the then president, had no authority to issue such an order. Throughout his entire statement to convince the public that it was a legitimate order he has failed to refer to a single lawful source from which fount springs his legal authority to order the transfer of public money from one government institution’s budgeted allocation to another. His reference to the many sections in the Financial Regulations of the Government of Sri Lanka and holding that it “authorises ‘Chief Accounting Officers’ (who in the case of the Presidential Secretariat was Lalith Weeratunga) to transfer money between government agencies under his authority on the basis of reimbursement” is nothing more than his own prejudiced interpretation of the law of the land – something perhaps he has become accustomed to after 10 years of being judge, jury, executioner and ‘lord of all he surveyed’ all rolled up and bundled into one as president for life – and thus is of no legal import, of no real value, akin only to a dud coin which, under scrutiny, will soon reveal its phony face. Finally for the icing on the Rajapaksa cake of deception contained in his last para. The crescendo to his operatic blunder. No one can disagree with that. A perfect textbook para. One to be engraved in gold and written in blood and tossed to the sky as one epitomizing the ideal relationship a civil servant should have with his political master. A learned judge of a competent court has thus described that transferring money from one government entity to another as illegal. The former president Rajapaksa claims his orders were legitimate but, in his ragamuffin statement, provides no credible reasons to prove its legitimacy. In his statement he speaks of Weeratunge’s dealings with the Telecommunication Regulatory Commission and how Weeratunga had referred, in his communications with the TRC and with various other bodies, that he had received verbal instructions from Rajapaksa, but does not present any evidence of any constitutional or legal right that he, Rajapaksa, had to issue such an order to his secretary. The illegality stems at the source and, if not dammed at its spring, pollutes the entire stream wherever it flows. Therein rests the crux of the matter. The issue is simply this. Forget the fact that the sil redi was distributed after the presidential elections were announced. The question that must be addressed is whether a top ranking civil servant should be granted immunity for following an order that lacks legal basis. The fact that it all happened after the election was declared only serves to aggravate the matter. Mr. Weeratunga and his fellow partner Pelpita have now appealed against their conviction. Rajapaksa has not merely presented his version but has already delivered his final judgment to clear him of any guilt for issuing instructions to Weeratunga to plunder public coffers without legal authority merely because his political master, who himself lacks the legal authority to issue such an order, tells him to do the needful. Soon the appeal will come to court. Till that day the truth must stay put.